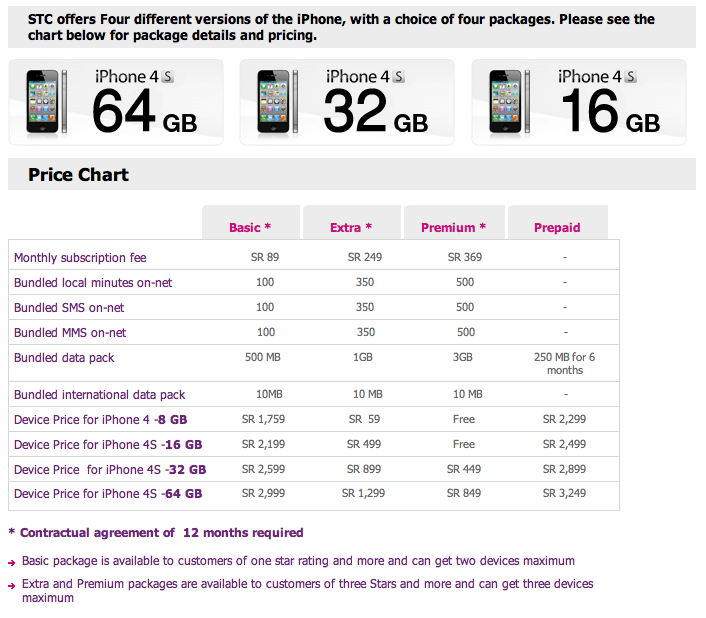 Update on 1 April: STC has reduced their iPhone 4S prices. 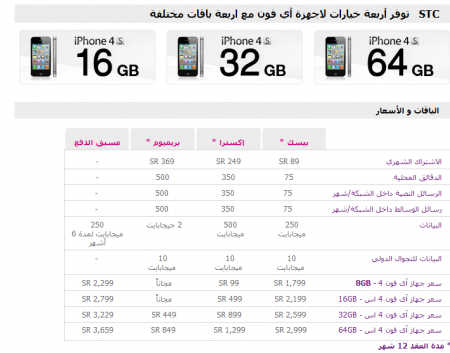 Mobily and STC has finally unveiled the official iPhone 4S prices and plans. 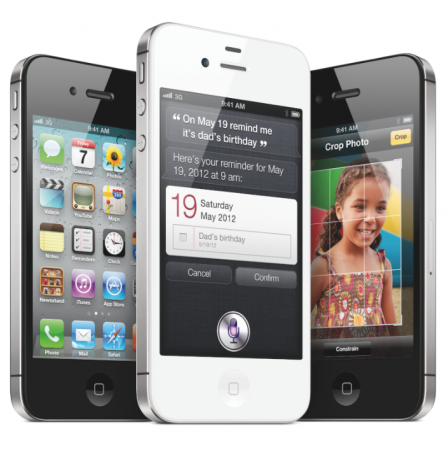 The iPhone 4S will officially launch in Saudi Arabia on Friday December 16th. However we noticed an increase in the prices from the iPhone 4. Prices for billed plans are in the following table. Translation from right to left: Basic Plan, Extra Plan, Premium Plan (each plan is 12 months), Prepaid Plan. 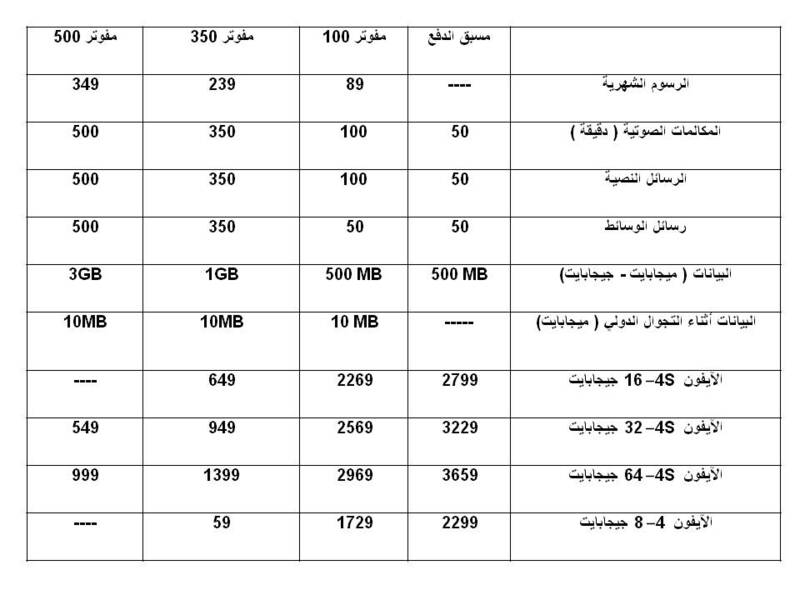 Translation from up to down: Monthly payment (SR), free local minutes, free SMS within STC network, free MMS within STC network, Data Plan (MB, GB), Roaming Data Plan (MB), Cost of the iPhone 4 8GB, 4S 16GB, 4S 32GB, 4S 32GB. The prices for billed plans are in this table. Translation from right to left: prepaid, billed 100, billed 350, billed 500. 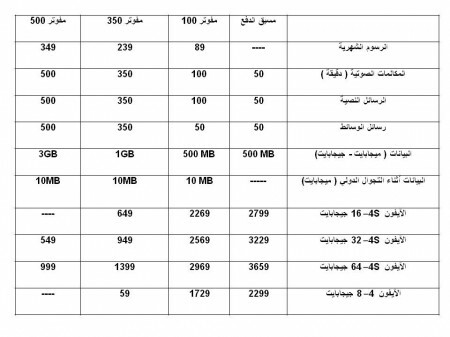 Translation from up to down: Monthly payment (SR), free minutes, free SMS, free MMS, free data (MB,GB), free roaming data (MB), iPhone 4S 16GB, iPhone 4S 32GB, iPhone 4S 64GB, iPhone 4 8GB. 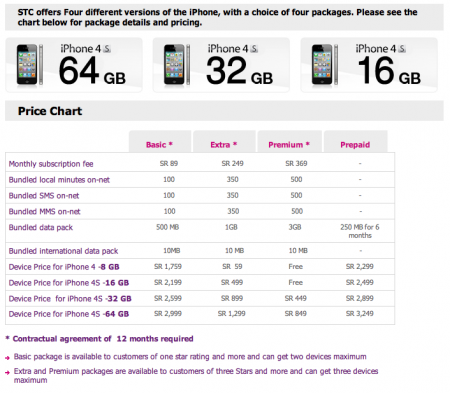 Both STC and Mobily offer similar priced iPhones so the difference will be in the service, coverage and bundles. We also noticed that the prices were raised from last year’s iPhone 4 prices. 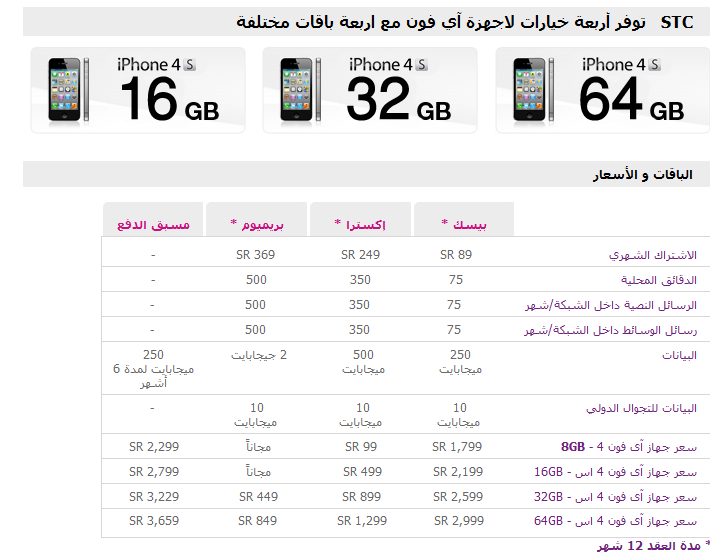 A prepaid iPhone 4 16GB used to cost 2,699 SR now it’s sold for 2,799 SR and the 32GB model was raised to 3,229 SR from 3,099 SR.
I’m impressed with the prices of STC and Mobily. They are very similar to international prices. Now I just hope they don’t make difference of facetime. browsing mobily’s iPhone 4S Pre-Order page, seems the FaceTime feature might be included this time as the iPhone-FaceTime image is on page, though digging more it cannot be seen on the “see all features” link…FaceTime on KSA, still murky. what time will the sale of the phones start , will it be the morning hour or the eveing. will FaceTime be available to iPhone4S now? otherwise, no matter how good the pricing is, it’ll be stupid to buy on these carriers when i can buy an iPhone4S with FaceTime with Apple’s Premium Reseller around..
You are right. Cause if they don’t introduce FaceTime in iPhone then the PremiumÂ ResellersÂ will have a reason to sell at a higher price. I totally agree, though the price is great compared to what you would pay for buying it internationally but facetime should work. I had to jailbreak my old Iphone 4 to get facetime running though i’m not a big fan. if you’re going to but your 4s with the carrier i.e. mobily/stc (given that the FaceTime-Ban has not been lifted yet) then the posibility of NO FACETIME is sure, even if your take it in the Philippines. The best thing is to buy your phone on the Premium Reseller (which now flocks around Jeddah, i-weaver, i-zone, AppStore), their prices might be higher compare to what the carrier is offering but at least you’ll have the full function of your phone. Check for the model number of the phone at the back of the casing, if the number is with this: XXXXXAE then there its a big NO-NO for FaceTime, jailbreaking your phone will work though…for iP4.